This segment is presented by Sandra Kurtin, a nurse practitioner at the University of Arizona Cancer Center in Tucson, Arizona. She will discuss ways the nurse can help in managing AML or acute myeloid leukemia. 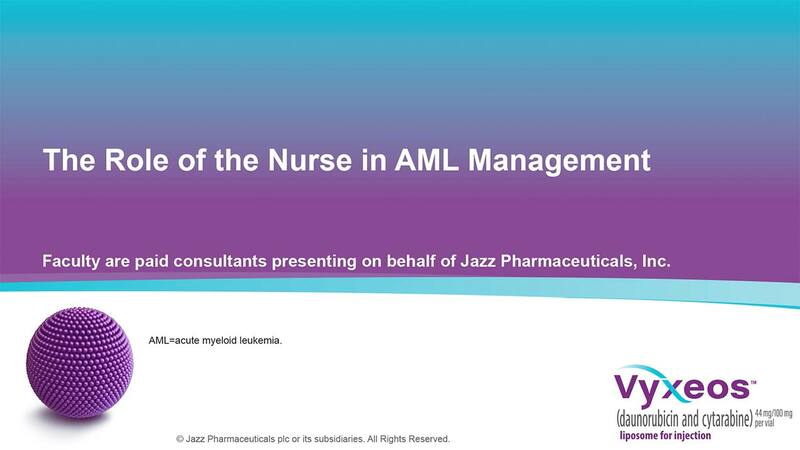 So then, let's talk a little bit about the role of the nurse in managing AML. So, what are the roles? Medication review, monitoring, and administration, obviously -- we're going to talk about that in detail. Looking for subtle changes that can signal complications associated with AML -- these patients can be quite sick for a period of time, and those little subtleties are important to basically identify early, and intervened promptly. And so, managing those side effects; preparing the patient to know what to look for and what to report -- really, really important. Supportive care -- so, we do use a lot of transfusion support; we use antibiotics, fluids, etc. And then, basically helping the patient and the caregiver through this process. So, AML is a difficult disease, and in people who have had prior cancers, the experience is a little bit different; they may have some frame of reference for that whole experience of being a cancer survivor. But nonetheless, here they are; they're abruptly plucked out of their survival mode into a new cancer mode, and one with a very poor prognosis needing quick decisions. So, the nursing role actually is very critical to that process. The pathophysiology of chemotherapy-induced cytopenias in AML ... So, you know you make the cells in your bone marrow, basically -- it is the origination of all of the components of blood. …originates in your bone marrow. When people develop cytopenias, there are a lot of different factors that play a role here, but basically, we say "Are you destroying them somehow? -- autoimmune hemolytic anemia; ITP; or, you're not making them?" And the only way to really know for sure ultimately is to do a bone marrow biopsy. So, we're going to look for, in this case, myeloid...symptoms; fatigue, obviously; pale skin; shortness of breath. There can be others. Tachycardia. Neutropenia -- there are different grades of neutropenia. So, mild would be an ANC less than 1,500; moderate, less than a thousand. We really start to be more concerned when they're less than 500. We know that febrile neutropenia has its own definition, so they changed the temperature scale here a few years back as well, and so it used to be 38.5, now it's 38.3 Celsius, over a 1-hour period. So, sustained temperature. Fevers, infection, shaking chills -- very common. And these are the things that patients need to know need to be reported immediately. If it's midnight you don't wait until 8 a.m. to come to the clinic -- you need to go to the emergency room, and they need to understand that plan. …so mild is a hundred to a hundred and forty-nine; moderate, 50 to 99; severe is less than 50. The risk of spontaneous bleeding really is increased at 10,000, which is now our threshold for transfusion. So, we used to transfuse less than 20, and now the restrictive transfusion policy is based on good data, are less than 10,000. What are some of the other common signs and symptoms that we can see in the presence of neutropenia? The risk of infection; any kind of disruption in the integrity of the skin or internal organs, so oral cavity, upper respiratory tract, you can see pneumonias particularly in this older population. …either bacterial, viral or fungal infections in this population, which each need to be monitored in the designated way.